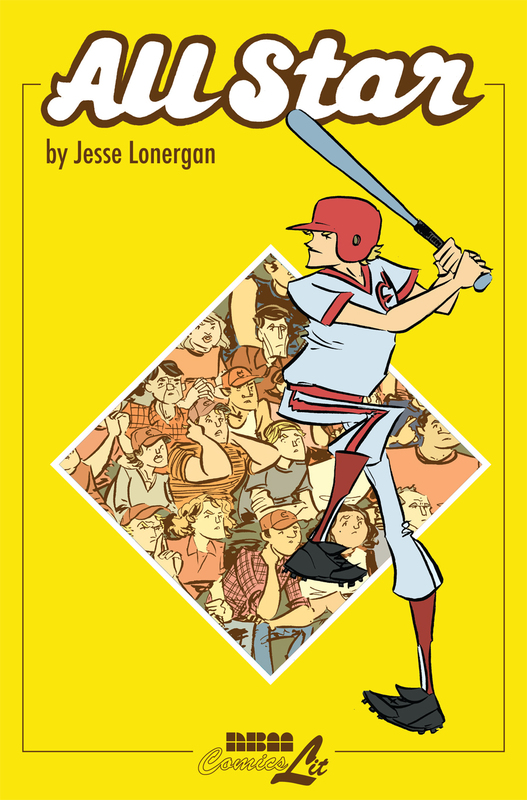 On April 1st & 2nd, NBM Graphic Novels (D147, D148) once again heads to the MoCCA Arts Festival and we are happy to have attending cartoonist Jon Nielsen, who will be appearing to promote the debut of his new book, LOOK. Also in attendance on behalf of our sister company, Papercutz is Harvey Award winner Jessica Abel who will be signing copies of her new series, Trish Trash, Roller Girl of Mars and Deb Lucke, creator of the Lunch Witch series. For generations and generations, the women of Grunhilda’s family have stirred up trouble in a big, black pot. Grunhilda inherits her famous ancestors’ recipes and cauldron, but no one believes in magic anymore. Despite the fact that Grunhilda’s only useful skill is cooking up potfuls of foul brew, she finds a job listing that might suit her: lunch lady. She delights in scaring the kids until she meets Madison, a girl with thick glasses and unfinished homework who doesn’t fit in. The two outsiders recognize each other. Madison needs help at school and at home, but helping people goes against everything Grunhilda’s believes in as a witch! Will this girl be able to thaw the Lunch Witch’s icy heart? Or will Grunhilda turn her back on a kindred spirit? NBM will also be bringing its latest graphic novels: Paco Roca’s Lighthouse, Rick Geary’s Black Dahlia, the acclaimed bios of Glenn Gould, Thoreau and others, and Cyril Pedrosa’s amazing and absorbing Equinoxes. Jon, Jessica and Deb will be appearing at the NBM Table (D147, D148) throughout the weekend. Come on by, meet some cool folks and celebrate comics! 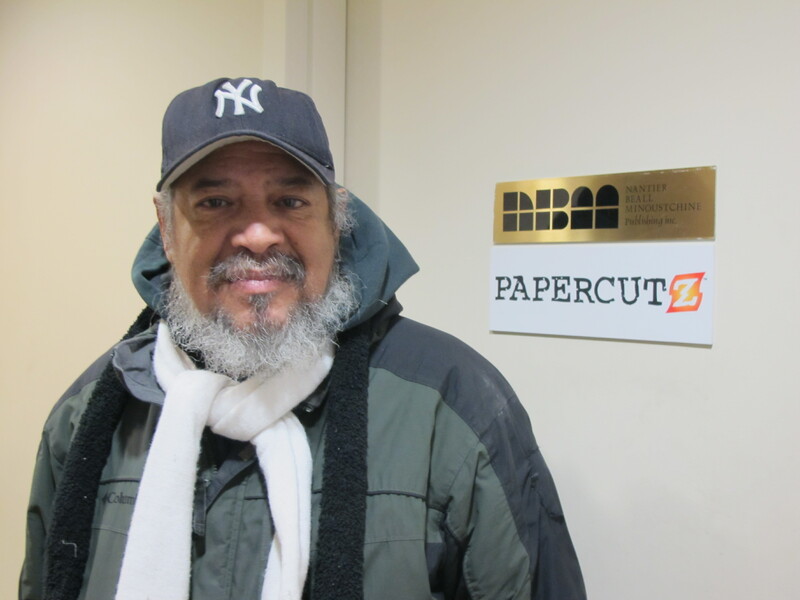 Earlier this week, Benjamin Melendez, the protagonist in the upcoming graphic novel “Ghetto Brother” visited NBM. Benjy is very excited that his life story is now going to reach a wide audience, telling the story of the Hoe Avenue Peace Meeting and how young people decided to go a non-violent path instead of seeking revenge and continuing the circle of violence. 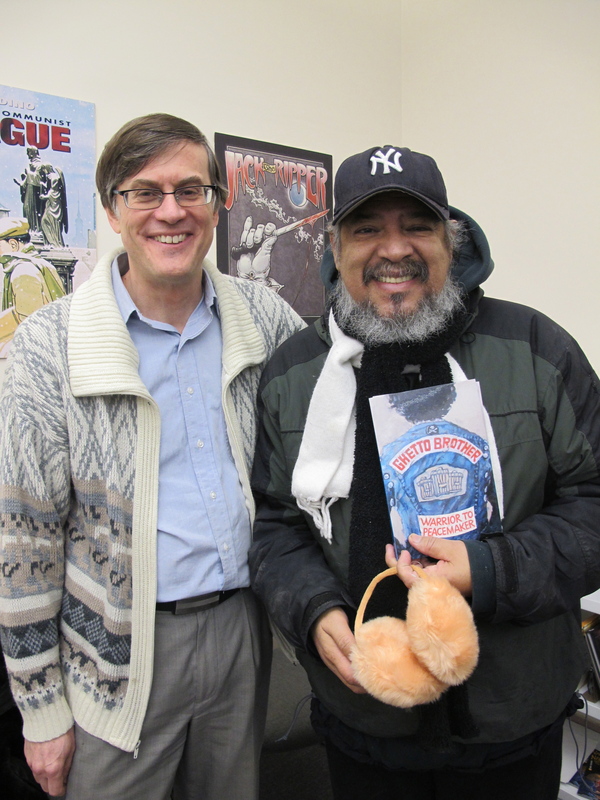 Terry Nantier presented Benjy with an advance reading copy of the book. 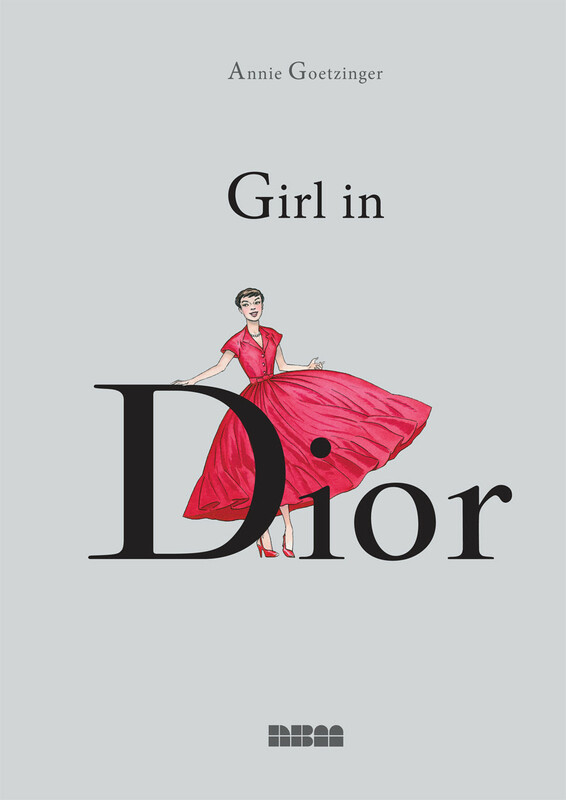 The official book presentation will take place in April during this year’s MoCCA Festival. NBM Publishing is once again heading to the MoCCA Arts Festival and we are happy to have both Jesse Lonergan, who will be appearing to promote the debut of his new book, the coming of age story All Star and Ted Rall who will be signing copies of the new edition of his book, SILK ROAD TO RUIN: Why Central Asia Is The Next Middle East. Set at the end of the school year in 1998 when Mark McGwire is racing Sammy Sosa to break the home run record, Bill Clinton is being questioned about a White House intern named Monica Lewinsky, and Semisonic’s ‘Closing Time’ is on top of the charts, Carl Carter is leading the Elizabeth Monarchs of rural Vermont to the state championship in his senior year. A full scholarship to the University of Maine is waiting for him, and everyone says he has a shot at the pros. He’s so good he can do whatever he wants. 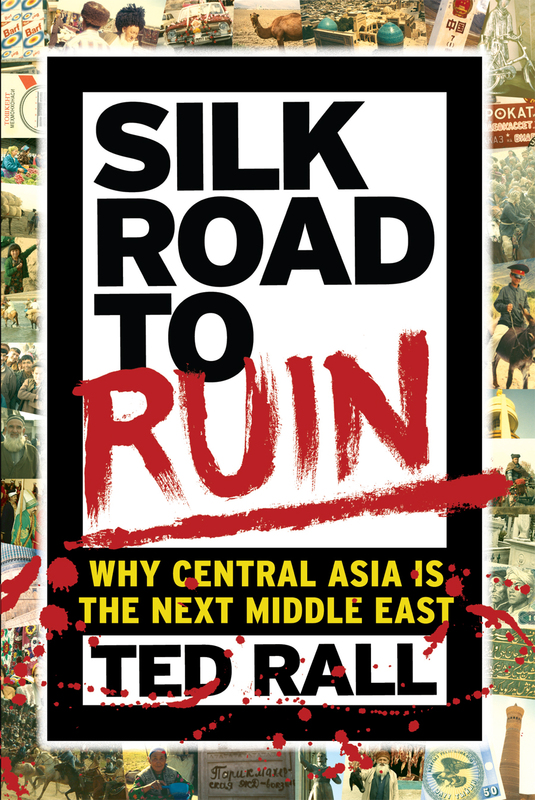 About SILK ROAD TO RUIN: Why Central Asia Is The Next Middle East – 2nd Ed. Combining articles with comic chapters relating his experiences retracing the old legendary Silk Road starting with the sublime history of China and ending in the absurdity of the petty dictatorships of the “The ‘Stans” where Rall had the temerity -or was it blustery stupidity?- to go back, including once with a group of listeners to his radio show, on a dare. Both Jesse and Ted will be appearing at the NBM Booth throughout the weekend. Be sure to follow @nbmpub on Twitter. So come on by, meet some cool folks and celebrate comics! Funny how one project can spin off into another entirely unrelated project. I’ll be attending MoCCA Festival 2012 on April 28th and 29th as a guest of honor. It came about after our publisher, Terry Nantier asked if I would attend to help promote the fifth volume of our Oscar Wilde Fairy Tale series. When I agreed he then suggested me to the organizers of the convention as the artist to do their promotional poster. They in turn asked me if I would like do it. I agreed. I had to set aside a project I was nearing completion on, a 174 page script and layout adaptation of Lois Lowry’s The Giver, to attend to the poster. I thought it would take about three days but worked on it for seven instead. Ironically my third day into it I had to set the poster aside for a day in order to produce the endpapers and back cover for the Oscar Wilde book.